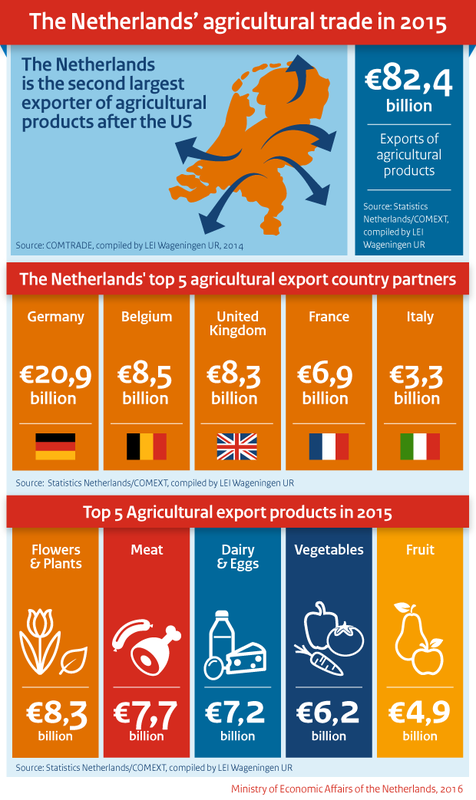 In 2015, the Netherlands again exceeded the previous year’s exports of agricultural products. Total exports in 2015 amounted to 82.4 billion euros. Compared to 2014, this is an increase of 700 million euros ( almost 1 percent). Within the European Union, Germany continues to be the most important trading partner. This was announced by the Minister for Agriculture, Martijn van Dam, at the Grüne Woche international agricultural fair in Berlin. The figures being presented here are estimates prepared by LEI Wageningen UR. The final export figures will, as always, be published in the summer. Agricultural exports represent 18.8 percent of total Dutch exports, which amounted to 438 billion euros in 2015. The Dutch agricultural trade mainly focuses on countries within the European Union. In 2014, more than 20 billion euros (25 percent) of Dutch agricultural exports went to Germany, making it our main trading partner. Belgium, the United Kingdom, France and Italy respectively account for 10.3 billion euros, 8.3 billion euros, 6.9 billion euros and 3.3 billion euros. Within Europe, the Netherlands mainly exports tomatoes, peppers, cucumbers, meat, fish, dairy and eggs. Flowers and plants are in great demand throughout the world. The Netherlands exports over 8 billion euros worth of these products. Furthermore, the Netherlands exports about 7.7 billion euros worth of meat, 7.2 billion euros worth of dairy and eggs products, 6.2 billion euros worth of vegetables and 4.9 billion euros worth of fruit. Last year, the Netherlands also opened up several new markets. In 2015, the Netherlands was the only EU Member State to obtain access to the US market for egg products, such as protein powder for hamburgers and ice cream. In total, the Netherlands can deliver about 420,000 kilos of egg powder (made from 100 million eggs) to the US. In addition, since last year, the Netherlands has exported about 9 million euros worth of onions to Indonesia and Panama. Late last year, Dutch apple and pear producers gained access to the Vietnamese market. It is expected that, within five years, exports will grow to around 7.5 million euros per year. The South African market for poultry meat has reopened. Exports of this product are currently worth 1 million euros per week. The Grüne Woche is the world’s largest international trade show for agriculture, horticulture and food. Sixty-eight countries are participating this year, and about half a million visitors are expected. The Netherlands has been represented at this fair since 1953, longer than any other foreign country. Many sectors of the agricultural, horticultural, fisheries and food industries are represented at the Dutch pavilion.